Adapted from Shauna Kelly's page at https://shaunakelly.com/word/concepts/tables.html with permission. We're creating the sample document and our next challenge is to position text on the page rather than just creating paragraphs of body text. In the old days, on a typewriter, you would do this by setting two tabs. You would tab once and type "Characters in the story". Then tab again to type "One fox, one dog.". If you used the space bar instead of the tab, it would make no difference to the final document. Word does it completely differently. You can use tabs to set up text like this, but it would be awkward. Much easier to create a table. What's a table got to do with positioning text? Yes, that's a table. But if we had only text in the table, and took out the borders, we could use a table to position our text on the page. There are two huge advantages of arranging text in a table. The first is that it is really easy to change the widths of the columns, which will determine how far left or right our text is positioned on the page. The second is that text wraps within a cell of the table. You don't have to work out how much text will fit on one line, and how much should go to the next. Word will do that for you. Position the Insertion Point (or cursor) where you want the table. For our sample document, that will be in the paragraph below the heading "Information about this document". You need two columns and three rows. You can do this by picking 2 colums and three rows directly as shown in Figure 2 below. Or, below that, you can pick "Insert Table" to bring up the traditional dialog box shown in Figure 3 below. 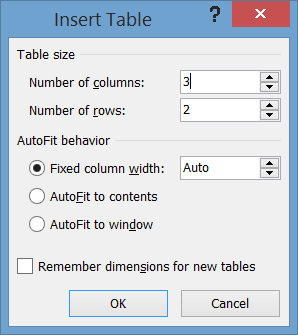 If you use the dialog box, make sure that you have selected Fixed Column Width, and that it is set to Auto. This is because, for this purpose, we need to decide for ourselves how wide the columns will be. 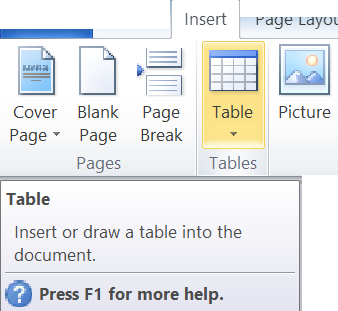 When you click in the bottom right corner of the grid, or, in the dialog box click OK, Word will insert your new table. There are two kinds of lines you should see around the cells of tables. Some are borders (Figure 4). Borders are seen when you print the document. You can change the borders, their thickness, color and style. Or you can delete them. Sometimes, when Word inserts a new table, the table will have borders around all the cells (it depends on what version of Word and how your machine is set up). Sometimes it won't have borders, but you will still be able to see the gridlines. Sometimes it will have neither. As you can see from these screenshots (Figures 4 and 5), it's sometimes difficult to tell which is which. Your new table: What else can you notice? There are several things to note here. There are two vertical columns, and three horizontal rows. Each box in the table is called a Cell. By default, the table is positioned just left of the left margin, and stretches to just right of the right margin. Word's default puts the table on the page so that text in the left column of the table will line up with text outside a table. There is always a paragraph after a table. Even if the table is the last thing in the document, there will be a paragraph after it, and you can't delete that last paragraph mark. We have to add our text in the cells of the table. We have to apply the appropriate style to the cells of the table. We may need to get rid of the borders. We want our text to be indented from the left margin. So we'll have to move the table over to the right. Click in a cell to type in that cell. Use Tab to move from one cell to the next. Complete your table so it looks something like the following. All of this text is Body Text. We can apply the style to the whole table at once. That will select (highlight) the whole table. Your table may have borders around it. If so, we need to remove them. To do that, click anywhere within the table. Right-click and from the context menu that pops up select Borders and Shading. Click the None box, and then OK.
You will still be able to see the gridlines, which are the guides to help you see where your table is so you can manipulate it. You can drag the vertical gridlines to change the horizontal position of the table, and to change the column widths. Hover your mouse between columns. When your mouse hits the sweet spot, the cursor changes to a double-headed arrow. You can now click and drag left or right to change the width of the column. Click once anywhere within your table. (Make sure no text is highlighted.) Hover your mouse over any of the vertical gridlines (the left of the table, the right of the table, or the one between the columns). When you hit the sweet spot, the cursor will change to a double-headed arrow pointing left and right (Figure 7). When you see that, click and drag to the left or right. You can use this to manipulate your table to get the columns just the way you want them. This page has shown you how to arrange text on the page using Tables. Don't use the spacebar to position text. The spacebar has only one function: to create a space between words. Columns are vertical. Rows are horizontal. The squares at the intersection of a row and a column are called cells. To add or remove borders (lines that print) around the cells of the table, select the table, then right-click within the table and pick Borders and Shading. Click None. Even when your table has no borders, you should see gridlines. These don't print. They are guides to allow you to manipulate your table. If you don't see the gridlines, click Table Tools Layout (tab) > Show Gridlines. Click in a cell to type in that cell. Use tab to move from cell to cell. Use your mouse and drag sideways to move the left edge of the table, the right edge of the table, or the gridlines between columns. or continue to read the Curiosity Shop box. To add a row to the bottom of your table, click in the last cell and press Tab. 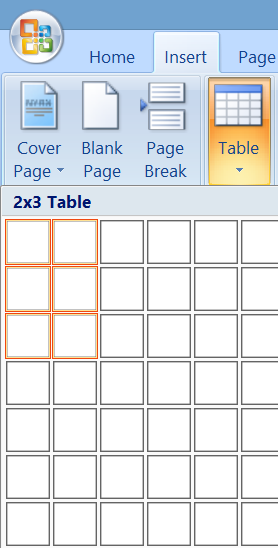 To insert a row in the middle of your table, click in the row where you want to insert the table. Choose Table > Insert > Rows Above or Rows Below. 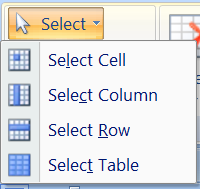 (In earlier versions of Word, choose Table > Insert > Row. Word will insert the row above the current row.) In Word 2013 and later, you can use the little plus sign that appears at the side of the table to add rows in the middle. Click within the row you want to delete. Right-click within the row and choose Delete Rows. To move a row up or down within a table, click in the row you want to move. Do Shift-Alt and up arrow to move the row up. Use Shift+Alt and down arrow to move the row down. It's worth remembering the combination of Shift+Alt + an arrow key. The same combination can be used to move any paragraph of text up or down within the document. So remember it now: Shift+Alt + an arrow key. Let's say you have a table with three rows: carrots, apples, bananas. You need to sort them into alphabetical order. To do this, click anywhere in your table, and on the Table Tools Layout tab choose Sort. You get several different options where you can choose how to perform the sort. Click within your table, then right-click to choose Borders and Shading. Choose the Borders tab. In that dialog box, select your line styles, widths and colours. Apply those lines to all or part of a table by clicking on the example table in the dialog box. Click once to apply. Click again to remove the border. In the Borders and Shading dialog on the Shading tab, you can add background shading to your table or to individual cells of the table. Note that some of the colours used in the example above aren't available in earlier versions of Word. Let's say you have a table like the Budget / Actual / Variance table, above. But your table is much longer, and extends over several pages. You might like to have the "Budget Actual Variance" row appear at the top of the table on each page. To do this, put your cursor in the top row, and choose on the Table Tools Layout tab the option to "Repeat Header Rows."